The first signs of aging are most evident around the eyes. The skin surrounding the eye is thin and delicate, so it is more susceptible to wrinkling, bagging or developing pockets of fat. Depending on your genetics, aging around the eye area can be see as early as 30 and even earlier if there has been significant exposure to the sun. Dr. Payman Simoni has been performing eyelid surgery for over 10 years. He is known for his excellent work and performs one of the best eyelid surgeries. He looks over all the least invasive methods for his patients that want to achieve a more youthful appearance. But there is much more that can be accomplished with modern occuloplastic surgery. Another exciting option for cosmetic eye enhancement is the lower lid blepharoplasty. “We’re able to reposition fat and simultaneously tighten the skin, all without visible incisions,” says Dr. Simoni. Lower lid blepharoplasty is an excellent procedure for addressing protruding and puffy under eye pockets, which are most noticeable in the morning. Because the eyelid skin is delicate and fatty deposits are necessary to a youthful result, lower lid eyelid surgery is an excellent procedure because fat is simply repositioned instead of removed. This creates a natural result without hollowness. Dr. Simoni tries to avoid external incisions in most cases. This is even more realistic as excess skin of the periorbital region can be addressed with a mild solution (20 to 25%) of TCA or trichloroacetic acid, a solution used in facial chemical peels. This can address all but the most severe of eye wrinkles. Would liposuction help make the epithelial folds below my eyes flatter and less prominent? First, it’s important to understand some of the causes of bags under the eyes. A number of factors can cause these epithelial folds. One of these factors is long-term squinting, which is more common in those who live in sunny climates. This can result in the enlargement (hypertrophy) of the obicularis muscle around the eye. Wearing sunglasses can not only prevent this type of muscle enlargement but can also help avoid cataracts. Another factor that can influence under eye folds is the presence of chronic allergies. Beyond that, normal aging can result in herniation of the fat under the eyes, which simply means the fat pads under the eyes have loosened and begun to visibly sag under the skin. Instead of using liposuction to remove these pockets of fat, we re-suspend the the herniated fat. Simply returning the fat to its correct position will restore a youthful look without making the eye look hollow. Will cosmetic eye surgery fix the lines under my eyes? While cosmetic eye surgery can tighten the skin around the eyes, it’s best to try non-invasive measures first. A TCA peel or laser resurfacing can effectively address fine lines of the lower eyelid. These treatments slough away the upper layer of skin, stimulating the dermis to generate new skin cells. Another alternative to eyelid surgery (blepharoplasty) is the use of lasers to repair fine lines. Their light passes through the upper layers of skin without destroying tissues and encourages the body to respond by forming new collagen. This can rejuvenate and thicker the lower eyelid skin and address fine lines. Eyelid surgeries are considered very safe procedures in general and produce consistent results. In the U.S. alone, there are more than 500,000 blepharoplasties performed every year. In Dr. Simoni’s practice, our emphasis is on rejuvenation through non-invasive techniques. 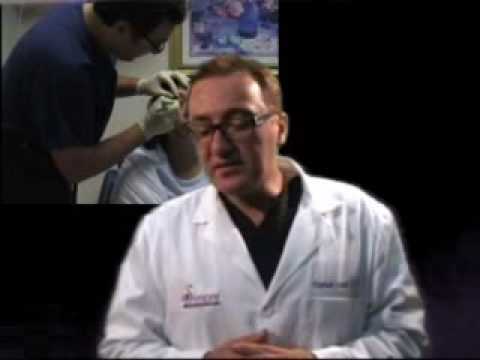 Dr. Simoni prefers performing the endoscopic brow lift to the upper blepharoplasty. By simply raising the muscle, excess skin can be easily tightened without removing delicate and irreplaceable skin. You can do a simple test to demonstrate this by using your fingertips to manually elevate the eyebrows. Restoring a youthful brow can often correct upper lid redundancy without an upper blepharoplasty. I did an upper lid lift five years ago when I was 41. Now, I am noticing some skin overhang again. My forehead is smooth as I already use Botox. What is the next procedure for me? It is important to understand that an upper eye lift does not address the brow. In fact, it actually pulls the lid slightly downward during the surgery. What you may be experiencing is the sag of the forehead as the muscles beneath it begin to stretch and relax. Botox can actually contribute to this phenomenon when administered horizontally across the forehead because it can relax the brow muscles that normally elevate this area of the face. Depending on how much skin was removed in your upper eye lift, you may still be a candidate for an endoscopic brow lift. If you are not an immediate candidate for the brow lift, you may be in the future as the skin continues to relax. Repeating a blepharoplasty is not recommended. An at home test may help determine whether or not you are ready for a brow lift: put your fingers above your eyebrows and lift. Gently close your eyes while you are doing this. If you can close your eyes, you may be eligible for a brow lift. If you cannot close your eyes, it is probably best that you wait before doing another eye or brow procedure. I’m in my early 30s and one year ago, I had my lower lid bags removed. Now, my eyes are excessively round and the whites show more than they should. I also have hollows under my eyes and am not happy with the way they look. What can I do? This sounds like you are experiencing a complication that is commonly known as “round eye” or “hound dog” deformity. A consultation will be needed to determined if revision eye surgery will address your cosmetic issues while also maintain a proper blink and eye function. Complications of lower eye surgery can be avoided by selecting a plastic surgeon who is very conservative with his procedures on lower eye skin and fat. Dr. Simoni prefers to resuspend orbital fat. This does not expose the bony orbit around the eye, which would create a hollow look. At the same time, he can reduce the appearance of under eye bags. The ideal incision within the eyelid keeps the lid from scarring in a way that it pulls down and exposes the white of the eye (the sclera). Depending on the severity of the issue, a resuspension of the lower lid (canthopexy), mid facelift or microlipotransfer of fat may help address these issues. Revision surgery is a complicated process and maintain the function of the eye is essential, which is the primary factor in determining whether any further cosmetic procedures can be done. Call today at (310) 360-1360 to schedule your consultation eyelid surgery. Also view our before and after photos of eyelid surgery and patient education videos where Dr. Simoni discusses this procedure.